Home / Blog / Link-building: when to expect results? Link-building is one of the main techniques used for SEO and the link building campaign is a crucial part of every Search Engine Optimization project, but how long does it take for results to appear? Normally, a link-building campaign is more of a long-term process rather than a short one as it takes around four to six months for directly related results to appear. It also requires a careful approach that will ultimately save time and money. Over juiced link-building campaigns usually end up doing more harm than good. Now that we’ve learned how much it takes for backlinks to produce their first effects, the next question arises: why does it take so long? 1. In order to increase the average ranking of your website, you first need to surpass your competitors in terms of number of backlinks. Link-building should be approached progressively and the number of backlinks should constantly grow. It’s not recommended to supercharge your link building campaign to get hundreds of backlinks a week. The number should increase progressively and thus it takes time to reach and surpass the number of backlinks of your competitors, especially if they also have an on-going a link-building campaign. 2. As mentioned in the point above, the number of backlinks should increase progressively. Google needs to see that this is a natural increase resulting from a great website that users love, and not an artificial backlink increase (which it is). If Google sees too many backlinks appearing over night for a specific website it becomes suspicious and then you will have a higher chance of getting penalized. In most cases is game over in terms of SEO. 3. 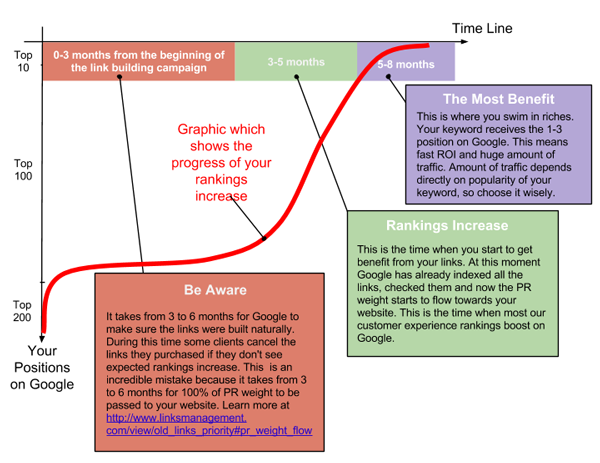 The age of backlinks affects your rankings. Every link-building campaign should be thoroughly and wisely controlled with patience at all times. A backlink becomes stronger as time passes, usually reaching its peak at around twelve months since it has been activated. It is crucial not to lose patience and deactivate or delete a backlink for cutting costs simply because no significant results have appeared. Time is you ally, and the more time it passes the more effective a backlink will become.